Comments It is the stuff of legends, what you must have heard of in fables – here is a stunning fully natural, untreated, unheated Blue Sapphire from the gem mines of Sri Lanka.The gem in its entirety is a classic piece, but what grips the attention first is the velvety cornflower blue color! Exotic, deep and enchanting, it gives this particular gemstone an aura of rich mystique that only a temptress exudes. This natural blue sapphire or Neelam is of 4.45 carats – which astrologically is a behemoth in the world of treatment free jyotish gemstones. With a superb weight, it also combines the positive features of almost 95 per cent clarity and great lustre. This cushion cut jewel has been set in an custom designed ornate 22 Karat gold ring. 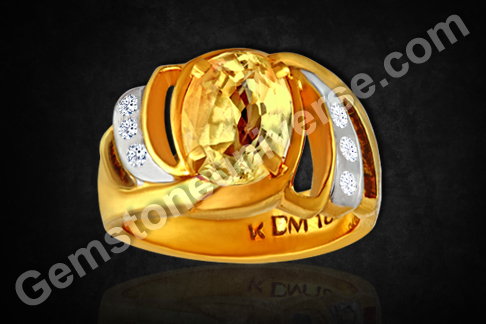 The shanks as well as the sides of the ring have diamonds accenting the gem. The shanks of this signature Gemstoneuniverse ring have been chiselled into a design that has an aristocratic quality about it. A superb gem and a befitting setting. The blue Sapphire harnesses the energy of the planet Saturn or Shani, who in favourable cases can turn around the life of the wearer in the most magnificent manner. Comments The Yellow Sapphire is a very unassuming and yet glorious gemstone of the planet Jupiter. Presented before you is a fully natural, untreated, unheated Yellow Sapphire of 3.48 carats from Sri Lanka famed for its gem mines.One cannot help but notice the luxuriously rich canary yellow color – a color that is most prized and coveted for the purpose of Jyotish gem therapy. 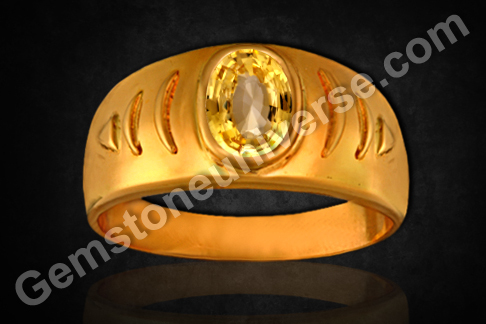 Yellow Sapphire or Pukhraj stone or Pushyaraag, as it is widely known, is a gemstone used to harness the pure, pristine and benevolent energies of Lord Brihaspati or Jupiter. Well, Jupiter is a planet whose results are generally auspicious and whose grace and blessings are vital for any kind of fortune to be unlocked and for all good events to occur. This yellow sapphire has been set in 22 karat gold and is accented by diamond simulants to bring out its beauty. 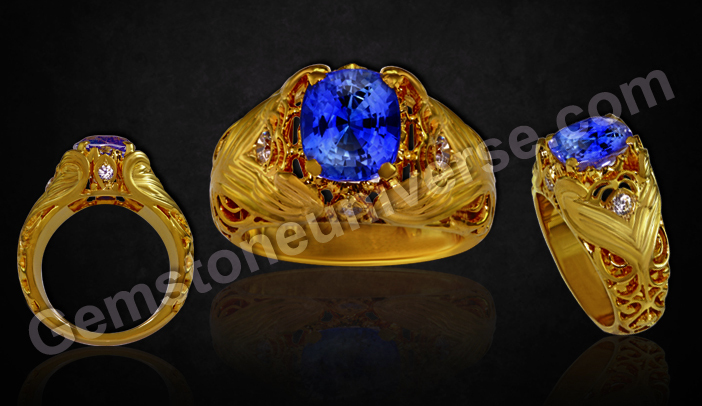 This customized ring design combines with it not only powers of planetary gem therapy but also does complete justice to the piece of jewelry! The color and brilliance of the gem are highlighted and overall effect is nothing short of imposing. 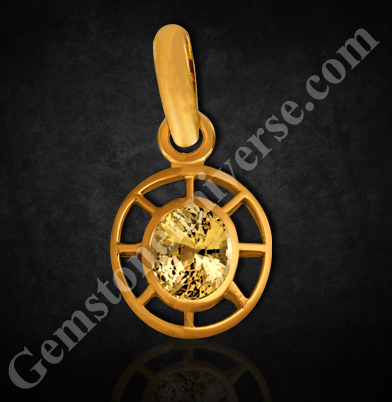 The Gemstoneuniverse advantage is apparent here – you get a beautiful and powerful talisman and at what a price. According to Vedic Astrology, the benefits derived from the gemstone of devguru Brihaspati are well known – heightened intelligence, good luck, harmony, auspicious events in life and what not! Yellow Sapphire holds special significance for female individuals as Jupiter is the natural significator for marriage. Set as a yellow sapphire ladies ring and worn in the index finger, it is known to bring to fruition any aspiration for marriage and subsequently foster harmony in relationships. Comments For us at Gemstoneuniverse each single Gemstone Ring or pendant that we provide is alive, alive with Vedic Energy, Energy that has the power of change, change for the positive, change for betterment.Every Single gem is so powerful and every single gem that we showcase gives us the opportunity of sharing with you knowledge and information not available easily. Knowledge that sets you apart from everybody else. – The clarity should be 85% and more that ensures a full play of light. 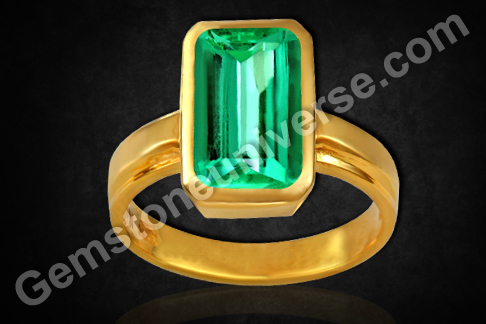 – Cut should be symmetrical adding to the beauty and lustre of the Emerald. – AND it should be treatment free. The Shastras specify that even among all shades of emerald only 7 shades are most preferred. 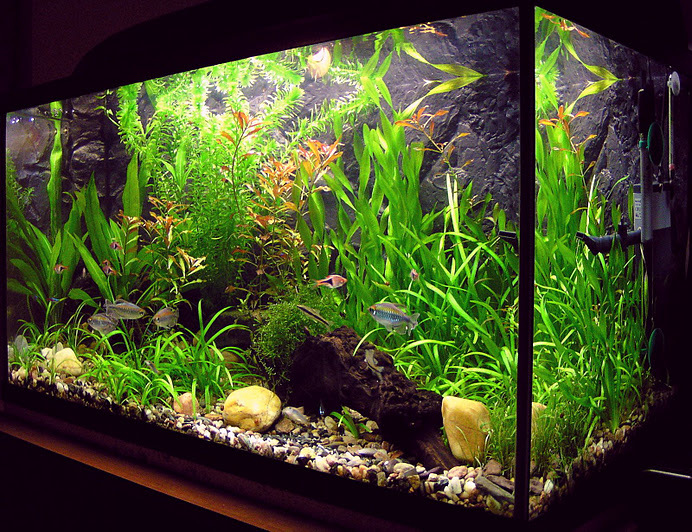 One of the shades of emeralds specified in the sacred texts is of the color of new born grass of the species Vallisneria Octandra. There are other 6 shades that also bring about the desired results. 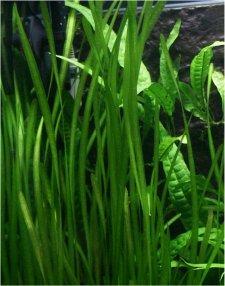 This particular Emerald featured above is of the color of Vallisneria Octandra. Just as the sacred texts specify preferred shades, the texts also specify undesirable shades that lead to problems and complications. So even if the Emerald qualifies on the bulleted points listed above for a Jyotish Quality Emerald if it is a Bishfota or has any other flaw as listed in the Shastras it fails to be a Jyotish Quality Gem. It will bring problems and complications. Gemstoneuniverse- No comparison, No competition! How to choose a Vedic Gemstone/ Flaws to avoid in a Jyotish Gemstone-Flawless Blue Sapphire of 4+ carats for Shani powers in Vedic Astrology. 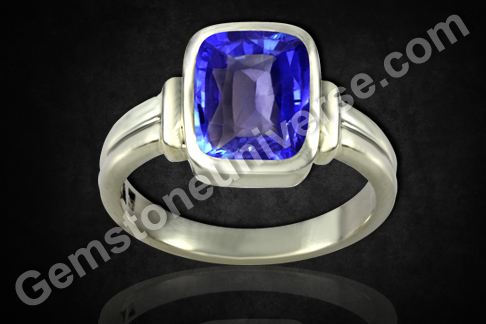 Comments Blue Sapphire also called as the Neelam has many benefits according to Indian Vedic Astrology. Gem of the powerful planet Lord Saturn/Shani Dev it has to be one of the fastest acting gemstones and one of the most impact creating gemstones. While selecting Blue Sapphire one should pay special attention that no flaws as listed in the sacred texts are present as they lead to negative results. This leads us to the discussion about what exactly is a Jyotish gemstone. A Jyotish Gemstone is a special class of a Gem that not only excels on the 4c’s of cut, color, clarity ,carat weight and lack of any enhancing treatment but it also has to be free from any of the flaws that cause detrimental results as per the sacred texts. This information is available to only a chosen few. For example one of the flaws listed in the Shastras to avoid in a Blue Sapphire is that it should not be Dudhiya. Dudhiya means it should not have spiral inclusions to a degree that a portion of the Sapphire looks milky. A Blue Sapphire which is a Dudhiya will cause loss from position and problems to one’s progeny. There are 16 such flaws listed in the sacred texts that the Blue Sapphire should be free of. So it might be possible that the Blue Sapphire might be unheated and natural, excels on the 4C’s and cost thousands of Dollars but still not be a Jyotish Gem if it is a Dudhiya or has any flaws listed in the sacred text. Similarly there are flaws listed for each of the 9 primary gemstones that have to be absolutely absent for a Gemstone to function as a Jyotish Gemstone and not cause negative results. Featured here is a fine sky Blue Sapphire of 4.27 carats. Notice the pleasing color, fine clarity leading to scintillation and electric lustre. Lack of any heat enhancement, the cut, and color, clarity and carat weight make it a very special Jyotish gemstone because not only it excels on the 4c’s and lack of treatment, it is free from any flaw as listed in the sacred texts. 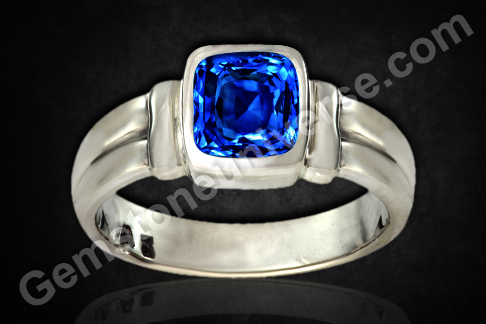 Such a Blue Sapphire will bring good fortune and wealth to its wearer. The excellence on the 4c’s lend it beauty and allure and freedom from any flaws render it powerful and potent to give the promised results. Note: At Gemstoneuniverse we move with a passion and service towards planetary gem therapy. Every single staff member is a GIA certified Gemologist plus an expert in examination of the Gemstones as per the sacred texts. 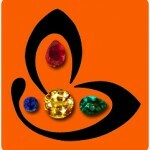 Every Single Gemstone that makes it to the Gemstoneuniverse inventory is a True Jyotish Gem that delivers true results. 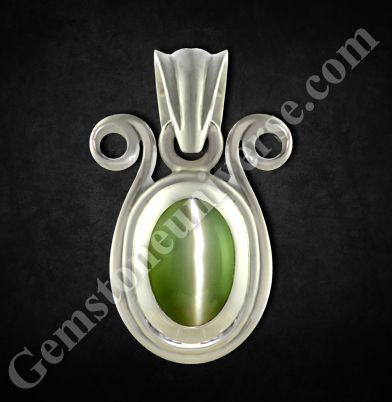 Comments The Magic of Vedic Gemstones and the magic of mother earth. Features here is a true Jyotish Gem. A 4.12 carats Colombian Emerald with no Oil. Fully natural with an amazing clarity above 95%, Fine bright summer grass green color this one is a 4C heavyweight. The singular outstanding factor in this gemstone is the rarity. At this size it s virtually impossible to get a fully natural Emerald. But here it is, in front of you. 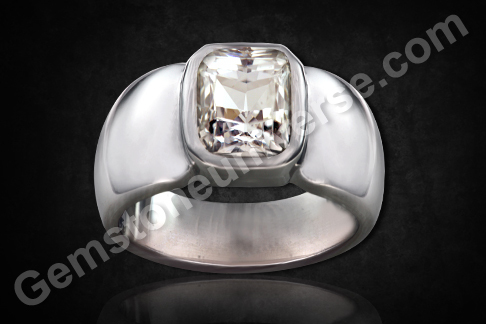 Traditional emerald cut, fine color, solid size and WOW clarity and what you have is a powerhouse of Mercury energies. 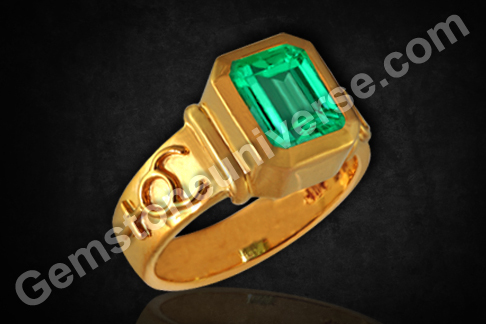 Such an emerald will give exceptional results as a Jyotish gem. Sacred texts speak that Gems with features present in natural emeralds such as in this one bring in many auspicious results and one gets to wear such gemstones only because of good karma and good fortune. Such rare and valuable gemstones bring in good fortune, riches, recognition not only to its owner but to his/ her entire family. Just the presence of such pure Gemstones has glad tidings for the whole clan. Such are the gemstones that appreciate so much over time that they are handed over from one generation to another. Such Gemstones get graded as Antiques and rarities with time. It is immensely satisfying that such a pure Emerald was provided by us and that the owner is a Gemstoneuniverse patron. Imagine the results one would get from this rare wonder from mother earth. A Gem is for a Gem. Absolutely! To view this Gemstone before it was set please click here. 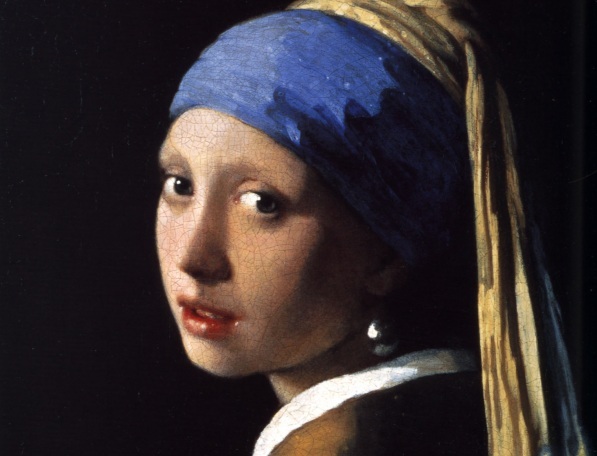 Comments One Look at this beauty and the mind instantly turns towards rarity. Those in the know understand how precious this Sapphire this. The sacred texts advocate the use of colorless unheated white sapphire to be used in lieu of a Diamond to harness Venus energies. Near flawless eye clean clarity, lack of heat enhancement, a solid 3+ carat weight and the rarity make this not just a superb Jyotish quality gemstone but also an investment instrument. Today unheated White sapphires are more rarer than unheated yellow and blue sapphires. The cushion cut adds to the draw of the gem and Gemologists would appreciate how close this white sapphire is in it visual appearance to the famed Diamonds of the Golconda region which have been classified as one with the finest water.